Some or all of these obstacles may be used. There may also be new additions not listed here. Both you and your dog must scale the great wall! There will be 3 of these obstacles on course. THE EVEN GREATER WALL! Ready, aim, jump through the windows! 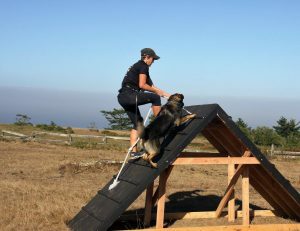 Precision, obedience and leash handling skills will be put to the test on this obstacle! Two of these on course. Doom knows no limits, all sizes crawl to meet doom head on. Scale the crests and traverse the lulls of the straw bale waves. One size fits all. You and your dog pull the tire using our double tug attachment. If your pooch isn’t into it, you get to do all the pulling! Ever been jealous of kids wallowing in ball pits? Well your time has come — The empty water bottle pit has been replaced by over 2000 balls. . .
How long will it take you and your dog to dig out a 12 x 18 x 18-inch area and pull out the flag? Follow the tire covered trail and conquer the hill of tires. Climb in and crawl through the muddy waters to the other side. . . This should probably be named slosh, not splash. Brave the mud and Run, Forest, Run! Carry 8 tennis balls to a bucket. You may only carry one at a time, but your dog can carry as many or few as he/she likes. If your dog isn’t into tennis balls, 8 trips back and forth for you! Your dog can follow or lead – you both must balance on a 12″ plank. You and your dog pick your way across a scrambled mound of 100 bales of hay. You and your dogs balance on and hop from bales to bales! Either carry your dog under one arm and a log under then other, or two logs under each arm and your dog on the leash. 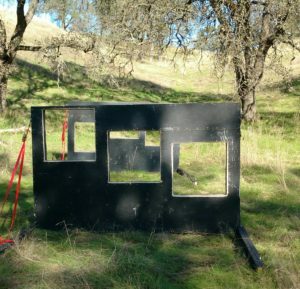 Thought A frames were just for agility? Think again! 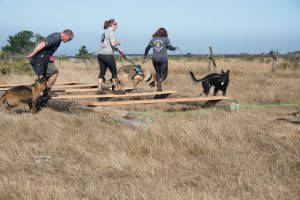 You and your dog will scale an A frame on the course. Scale the berms and descend into water. The water is clean and shin deep in places. 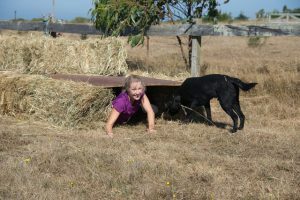 You and your dog climb to new heights on the straw bale pyramid! 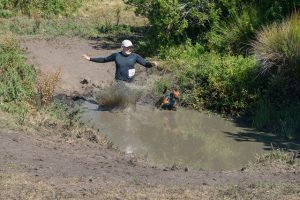 CALISTOGA SPECIAL: Mud Pit Extraordinaire! Calistoga mud baths have nothing on our mud pit where you and your pooch can wallow to your hearts’ content. Grab the rope and scramble up the 20 ft bank.